People who are above the age of 52 start considering the options in terms of getting financial stability and assurance against unexpected health situations. Will your loved ones be cared for or will you leave them with a financial burden should you pass away earlier than expected? 52 years is a good time to start looking for an insurance policy, as you would still be able to buy at a decent premium rate as compared to others who do it at the retirement age. There are many reasons that an individual would start looking for the right plan after reaching the golden years of his life. 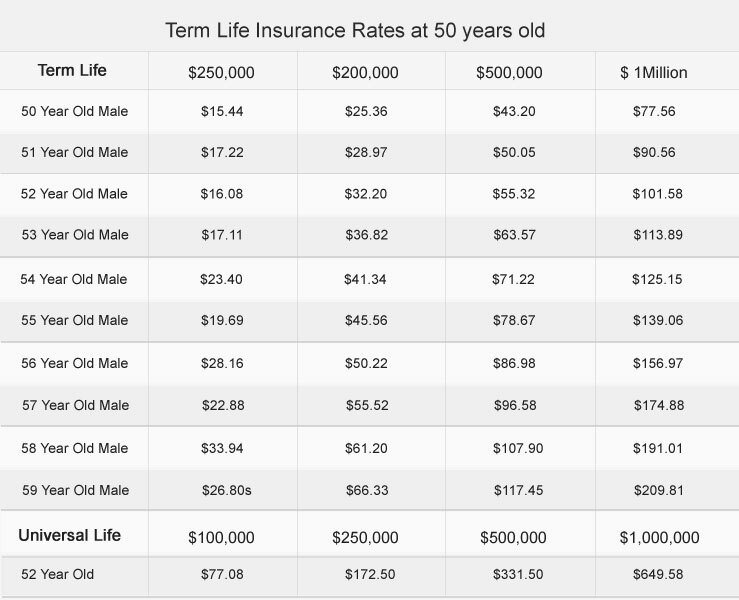 Whole or Term life insurance at 52? There are two primary options: You can opt for either term life or whole life coverage. It will cover you for the length of a term that you specify when buying a policy. This is the most popular type of insurance and allows more flexibility although your cover expires at the end of the term and those needing further cover must re-enroll. Whole life insurance is a permanent option which allows for coverage as long as the insured keeps up their premium payments. These policies accrue cash value over time and are considered an asset that the policyholder can borrow against, so are useful from an investment perspective. These are the two basic options for those who want an insurance plan at age 52. Once you have decided upon term or whole life coverage, it’s important to decide what you want it to cover you for and who will benefit should you need to claim. The rates mentioned in the above chart are for those who enjoy a healthy lifestyle. The applicants who do not have pre-existing conditions and non-tobacco smokers would receive the best quotes. There are many variables that can affect your policy application and your premium rate. Often the outcome of the paramedical exam plays a large part in the underwriting decisions. Life insurance at 52: Get insured today! Shop around for insurance: after all, this plan will last you for years, if not a lifetime. It’s important that you get it right at the beginning, and then you don’t need to concern yourself with anything but making regular premium payments. Policies, premiums and benefits differ between providers, so it’s a good idea to discuss your requirements with a professional before entering into a policy at 52 years old.